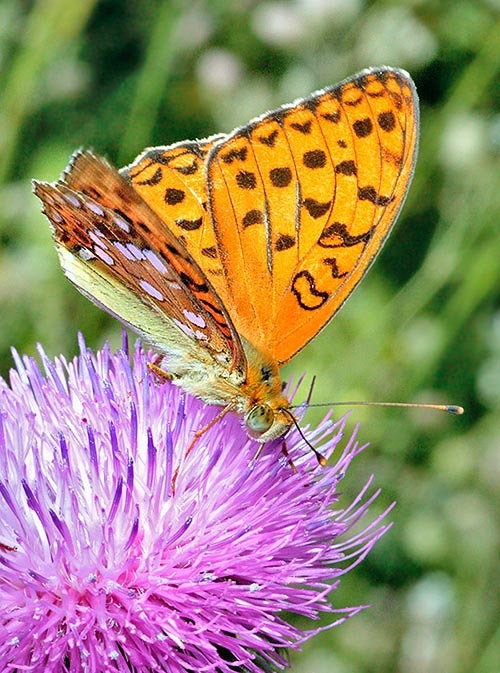 The Dark green fritillary (Mesoacidalia aglaja Linnaeus, 1758) belongs to the order of the Lepidoptera and to the family of the Nymphalidae. In this family are usually included more than 6.000 species of butterflies scattered all over the world, and therefore is deemed to be the most consistent among those grouping the diurnal lepidopterans. It is difficult to recognize this species if observing only the drawing on the upper page of the wings. The strong resemblance to Fabriciana adippe and Fabriciana niobe render it practically indistinguishable. It differs from Fabriciana adippe due to the lower face of the hind wing usually more suffused with green and due to the smaller silvery spots. Furthermore are missing the silvery spots with reddish contour in the post-discal area, which are on the contrary present in Fabriciana adippe as well as in Fabriciana niobe. Fabriciana niobe has a green shade only in the basal area and a whitish spot with black dot in the cell, missing in the other two species. The Mesoacidalia aglaja has a fast flight and is usually found in the open countryside and occasionally in the woods. The scientific name of the genus has been substantially modified several times during the years (please see the Synonyms), and still now maintains this variability. Though many authors consider Mesoacidalia the genus to which to assign it, others place it amongst the Argynnis. “Mesoacidalia” comes from the union of two terms, from the Greek “mesos” = in the middle of and Acidalia, famous fountain of old Greece close to Orchomenus of Boeotia where Venus bathed along with the three Graces. For the etymology of the term Argynnis, please see Argynnis paphia. “Aglaja”, the name assigned to the species, is on the contrary referring to one of the three Graces. The common European names are rather different, but all do give an indication of elegance to this beautiful and coloured butterfly and in some cases refer directly to the green and silver colour appearing on its livery: in English, Dark Green Fritillary; in French, Grand nacré; in German, Grosse Perlmutterfalter; in Dutch, Grote Parelmoervlinder; in Catalan, Argentada de muntanyia. It is much diffused in all Europe up to Cape North, reaching China and Japan through the tempered belt of Asia. It is present, even if not much common, in North Africa, but is absent in Sardinia, Corsica and in several Mediterranean islands. In Great Britain, it is often localized in the hinterland grassy pastures whilst is very common on the coasts. 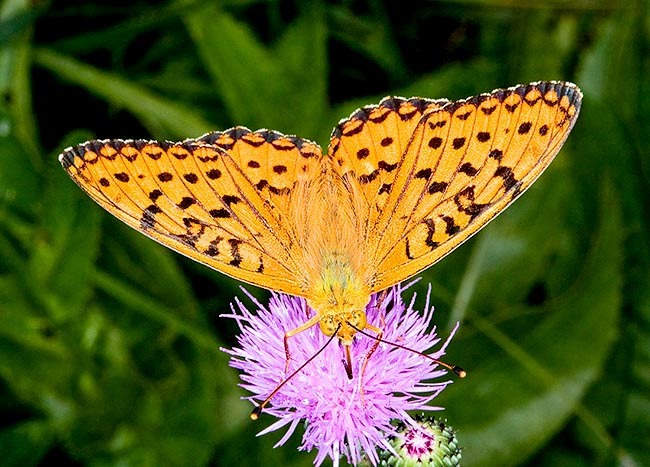 Contrary to the silver-washed fritillary which has an ideal habitat linked to the woods, the dark green fritillary lives almost exclusively in the grassy prairies transiting only casually in wooded areas. It is a butterfly which keeps constantly the territory for long periods and it can be found unfailingly every year in the same location. It is present from the sea level up to the 1.500 metres of altitude and in favourable seasons even at higher altitudes, finding its best habitat between the 300 and the 800 m above the sea level. The Mesoacidalia aglaja is a butterfly with a decent wingspan as it reaches even the 6 cm and stands among the biggest ones of all fritillaries even if remarkably smaller than the silver-washed fritillary. It has bright orange/golden colours on the fore face of the wings, with blackish spots and stripes alternated with some perfectly round spots and with variously sized lunettes that surround the borders of both wings. It has yellowish brown well developed and robust antennae, with flattened and rounded vertex. On the reverse of the fore wing appear more or less accentuated black drawings, on paler orange background and with a slight greenish hue on the apex. On the back of the lower wing the drawings disappear replaced by well defined and brilliant silvery spots, on an accentuated greenish background. Around the whole border are present small silvery lunettes more reduced than those of the Fabriciana adippe, the most similar and mistakable species. 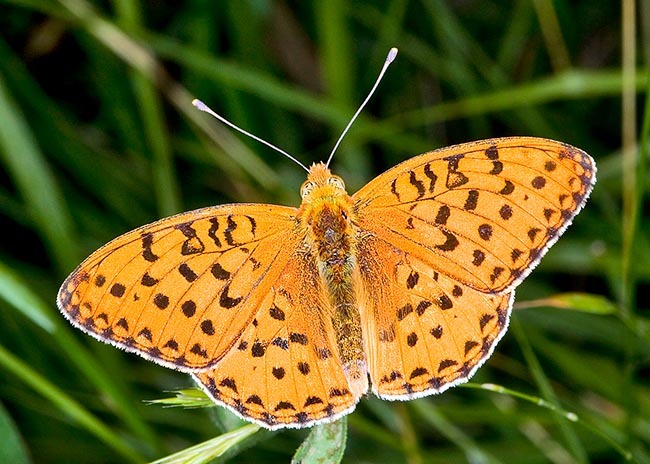 As already said, moreover, the dark green fritillary lacks in the post-discal belt of the small silvery spots bordered by red which distinguish the high brown fritillary and the niobe, characteristic which is essential for the determination. A slight dimorphism is present between the two genera, as the male shoes more evidently on the upper face of the wings the orange colours that in the female are partially attenuated. It flies during the warmest months, from June up to late August and as all other fritillaries, loves many flowers, among which Buddleja, Aster, Zinnia and Rubus. It has fast movements and a powerful flight which it suddenly stops as soon as it sees a flower to its liking. Very lively butterfly and with nervous flying and not always easy to approach and observe, not even when feeding. It is a monovoltine species. The caterpillars of the dark green fritillary are easy to distinguish from those of the silver-washed fritillary, much more than the butterflies themselves. They are black with two parallel white lines running along the back and with sides spotted by red dots surrounded by small blackish spines. Also the head is black. The caterpillars come to life in September and hibernate when still very small and do not begin feeding before the following spring. During the day they stay hiding at some distance from the nursing plant and usually move by dusk for reaching the feeding place. The spring growth is progressive and constant but somewhat slow if compared with the small fritillaries. The larvae pupate for an about 15/20 days metamorphosis. Host plant: Viola palustris and Viola tricolor but also other species of the genus Viola. Papilio aglaja Linnaeus, 1758; Papilio pasinhoe Linnaeus, 1767; Papilio charlotta Haworth, 1802; Argynnis aglaja Wahlberg; Speyera aglaja Speyer, 1880. → For general notions about the Lepidoptera please click here. → To appreciate the biodiversity within the BUTTERFLIES please click here.